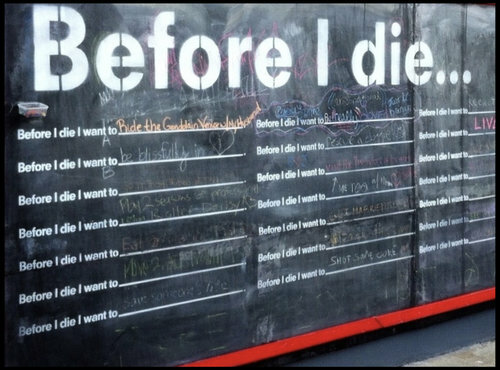 Have you ever created a bucket list? You may not think too often about crossing over but I’m sure you have things that you’d like to get done before you kick the bucket. This is sort of like a list of goals put in writing. It will keep you motivated and you’ll feel a sense of accomplishment as you cross each one off your list. What are some of the things that excite you and maybe even scare you a bit or a lot? After all you only have one chance to do things in this life. Do not miss your opportunity to do what you can in this lifetime. Make time to sit down and think about what you want to experience in the short time you have here on earth. Think of each minute that passes by as an unrepeatable miracle. Don’t waste it.